Andrew Tyrie says the Chichester community ‘lost confidence’ in Highways England’s A27 improvement options following the shock announcement that the scheme has been scrapped. Transport secretary yesterday wrote to Highways England’s CEO Jim O’Sullivan to say he was cancelling the scheme because of the loss of support of local councils and ‘significant local campaigns. Full story here. Responding to the shock news, Chichester MP Mr Tyrie wrote on his website: “We have to try to persuade the Government eventually to return to this. And before we do so, we have to find a solution that can unite the whole community. “None of Highways England’s schemes could achieve this. So they lost the confidence of the community. 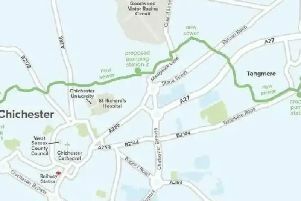 “My constituents needed to feel confident that their access to the A27 and to nearby roads would be improved, and that local traffic would not end up diverted into the centre of Chichester, aggravating existing problems. “They did not feel confident about either of these. “I made these points, and others, vigorously to the Secretary of State on behalf of many constituents. “But the appalling congestion in and around Chichester will only get worse. “And more than £200 million of public investment earmarked for the area will now be spent in other parts of the country or handed back to the Treasury.